This tool will tell you when it will happens so you can backup your files! Have you ever suffered through the pain and agony of a hard drive failure? To you, it’s pretty straightforward — one day your computer is humming along smoothly, and the next day it won’t boot at all. But what you may not know is that, beyond the capabilities of your human senses, a whole host of little warning signs and other signals can actually tell you when hard drive failure is imminent! That’s why Hard Disk Sentinel is so important. Hard Disk Sentinel monitors and analyzes your hard disk and solid state drives, giving you valuable feedback on the health of the drive, any performance degradations, and warning of impending failure. With Hard Disk Sentinel, you’ll be able to find, test, diagnose, and even repair disk drive issues before they escalate to catastrophic status. And you won’t have to worry about getting overwhelmed with a bunch of technical babble — Hard Disk Sentinel gives you an easily understandable description of what’s going on, and offers tips on how to proceed! A laundry list of alerts and reports gives you the ultimate flexibility to determine how close you wish to monitor your drives, letting you safeguard your data at all times. 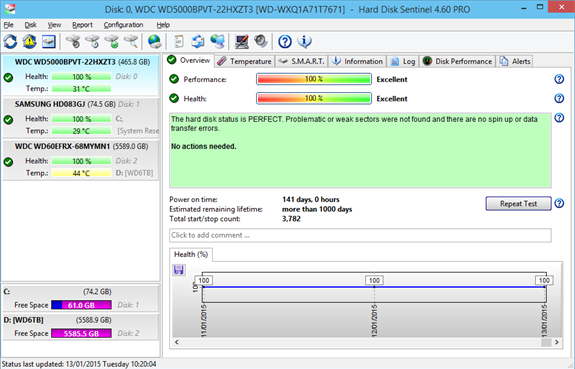 Unlike some other titles on the market, Hard Disk Sentinel is a complete monitoring solution. There’s no need to purchase other tools in order to verify internal hard disks, external hard disks, SSDs, or disks in RAID arrays! What kinds of info do you get with Hard Disk Sentinel? How about temperature, and the ability to view S.M.A.R.T. (Self Monitoring, Analysis, and Reporting Technology) data, a feature built into the latest disk drives. There’s also real-time monitoring of disk transfer speeds, an important indicator of a failing hard drive! Please note: online license activation is required. License grants usage on one computer at a time.